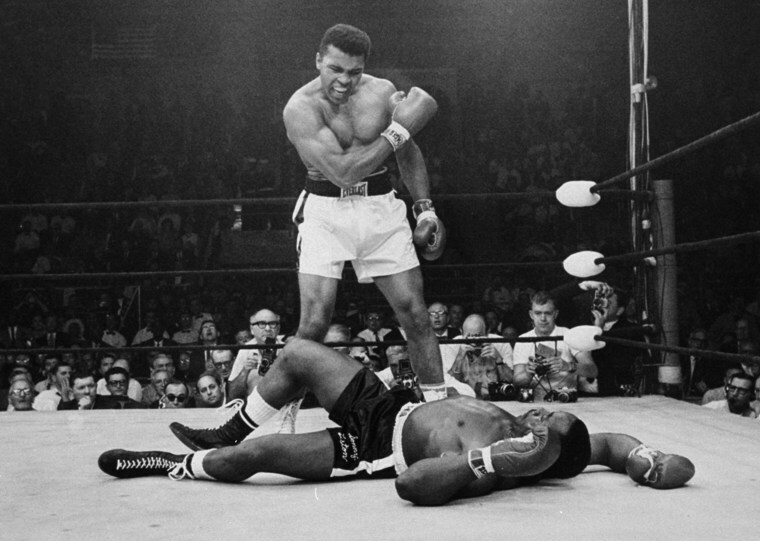 Muhammad Ali, originally known as Cassius Clay, is considered to be the greatest heavyweight boxer in the history of the sport. Muhammad Ali, known then as Cassius Clay, with his trainer Angelo Dundee at City Parks Gym in New York, Feb. 8, 1962. 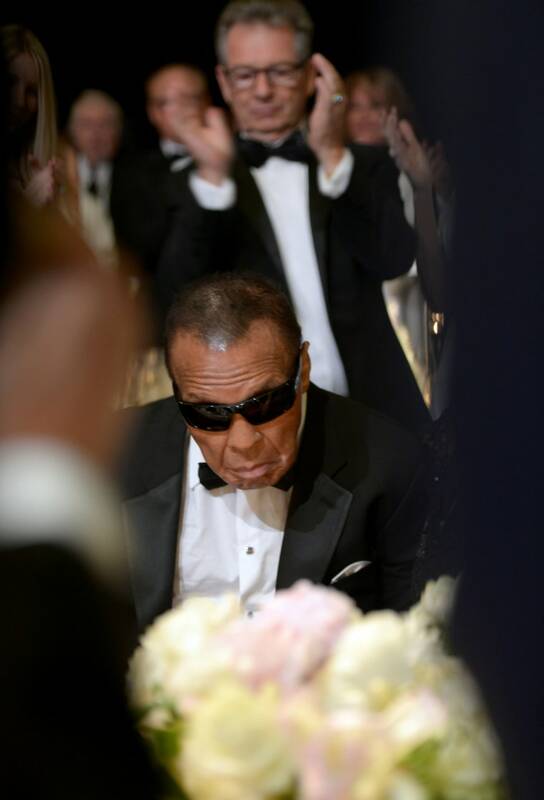 Ali, the silver-tongued boxer and civil rights champion who famously proclaimed himself "The Greatest" and then spent a lifetime living up to the billing, died on June 3, 2016. Cassius Clay, 20-year-old heavyweight contender from Louisville, Kentucky, poses in May 1962. 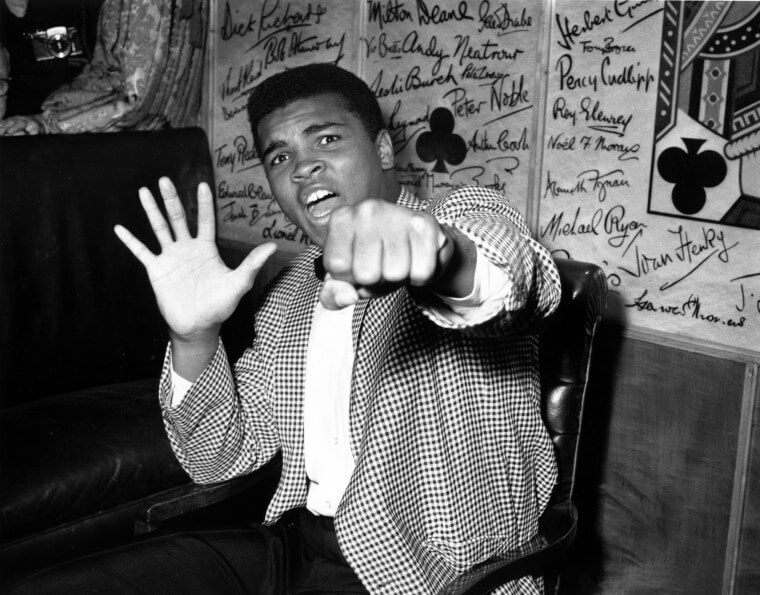 Clay, who later changed his name to Muhammad Ali, points to a sign he wrote on a chalk board in his dressing room before his fight against Archie Moore in Los Angeles, predicting he would knock Moore out in the fourth round, which he went on to do. The sign also predicts he'll be the next champ via a knockout over Sonny Liston in eight rounds. He did it in seven rounds. A supremely confident Clay holds up five fingers in a prediction of how many rounds it will take him to knock out British boxer Henry Cooper on May 27, 1963. 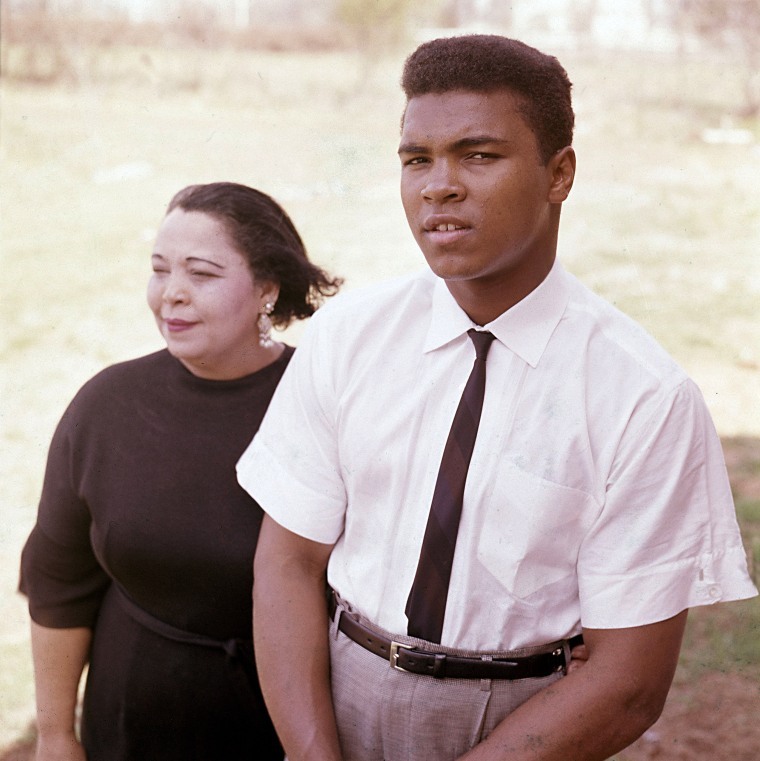 Clay with his mother, Odessa Grady Clay, in April 1963. Clay reads about his boxing match in the paper. 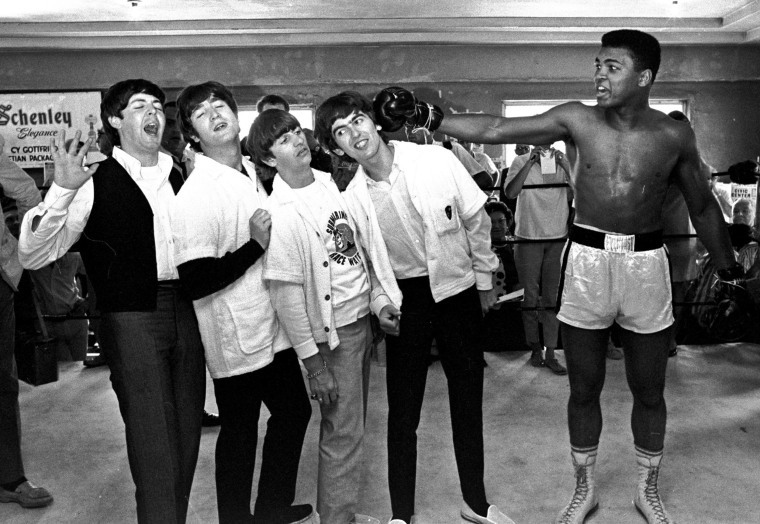 The Beatles' Paul McCartney, John Lennon, Ringo Starr, and George Harrison, take a fake blow from Clay, while visiting the heavyweight contender at his training camp in Miami Beach, Florida. 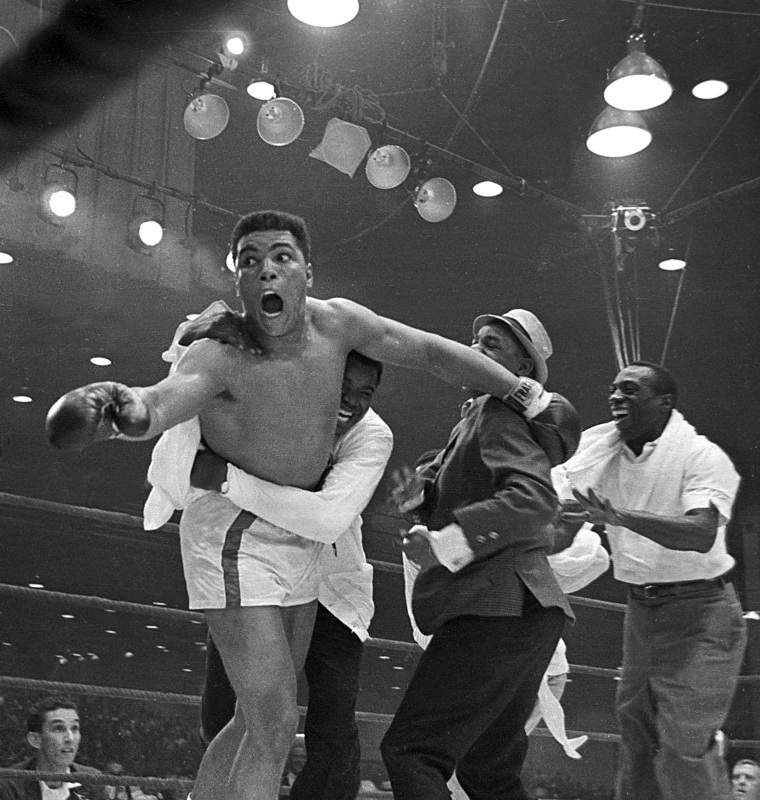 Clay's handlers hold him back after he is announced the new heavyweight world champion on a seventh round technical knockout against Sonny Liston at Convention Hall in Miami Beach, Florida on Feb. 25, 1964. 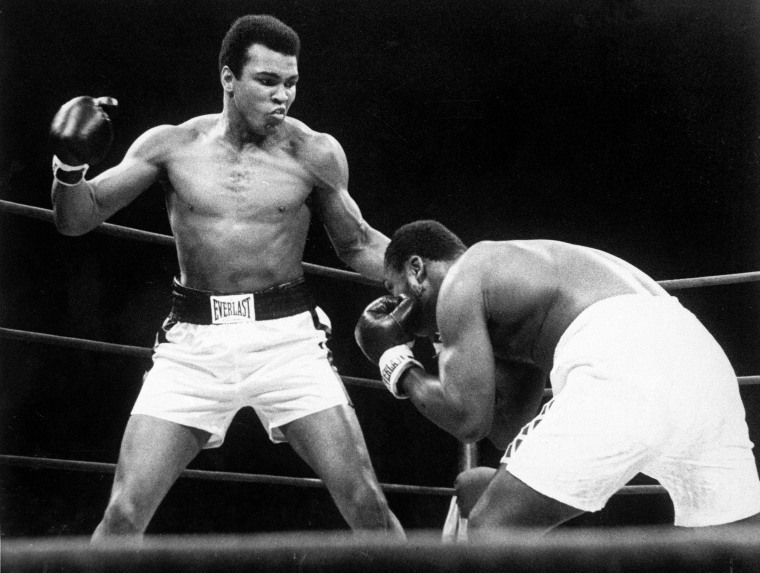 The new champion soon renounced Cassius Clay as his "slave name" and said he would be known from then by the Muslim name Muhammad Ali. 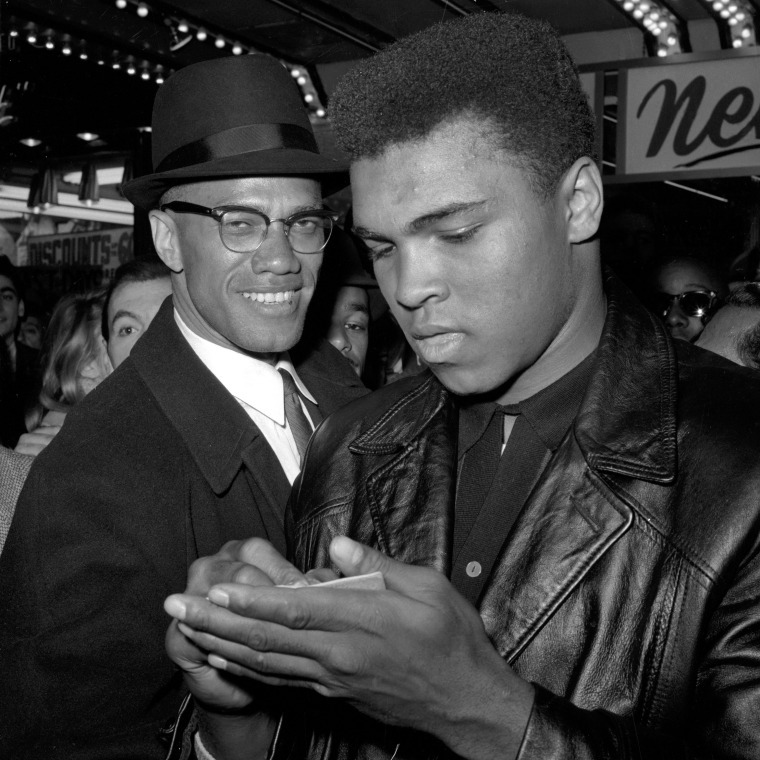 Muhammad Ali with Malcolm X outside the Trans-Lux Newsreel Theater in New York on March 1, 1964, where they had just watched a film screening on Ali's title fight with Sonny Liston in Miami Beach. Inspired by Malcolm X, the boxer converted to Islam in 1963, but he kept his new faith a secret until the heavyweight crown was safely in hand. 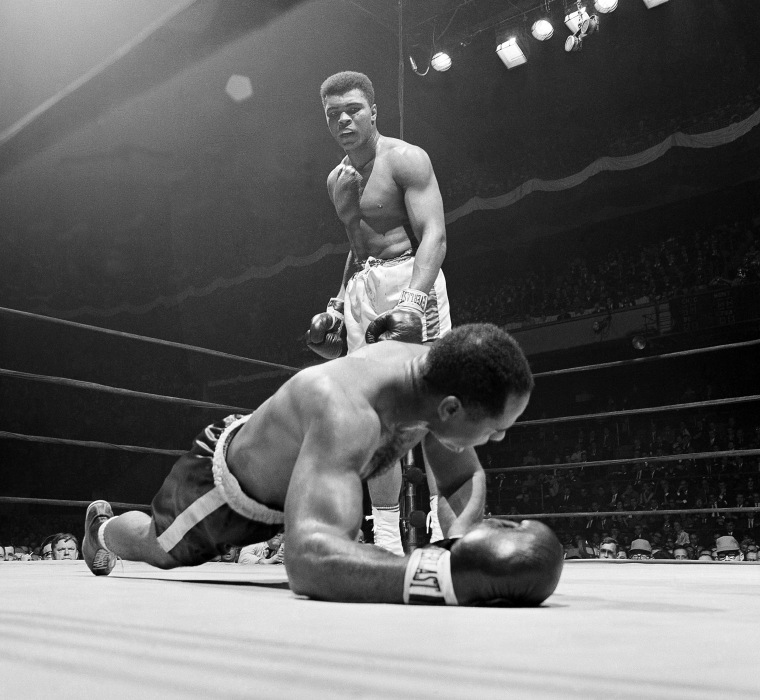 Heavyweight champion Muhammad Ali stands over fallen challenger Sonny Liston, shouting and gesturing shortly after dropping Liston with a short hard right to the jaw on May 25, 1965, in Lewiston, Maine. The bout lasted only one minute into the first round. 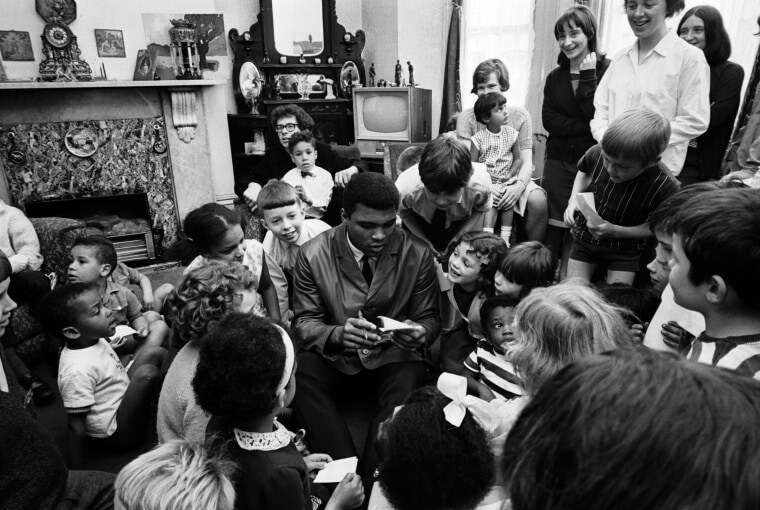 Muhammad Ali signs autographs during a visit to the London Free School children's play group in Notting Hill, London, May 15, 1966. 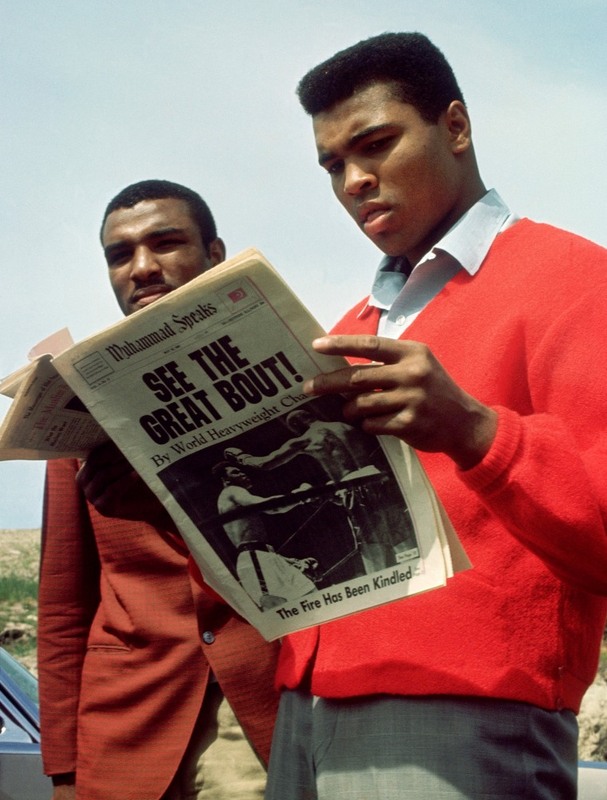 Ali was in London for his upcoming title defense against British champion Henry Cooper. 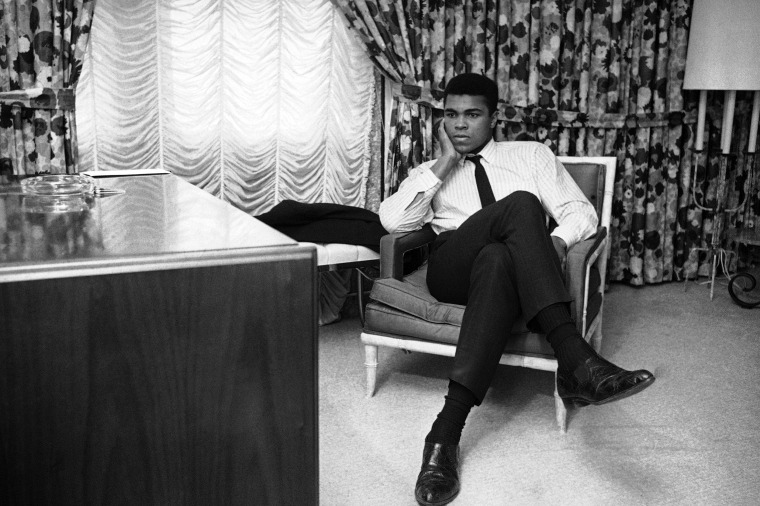 World heavyweight champion Ali sits in his room in Houston in February 1967. The champ was silent on his efforts to seek a draft deferment on grounds that he is a Muslim minister. The Houston Selective Service appeals board refused his appeal. 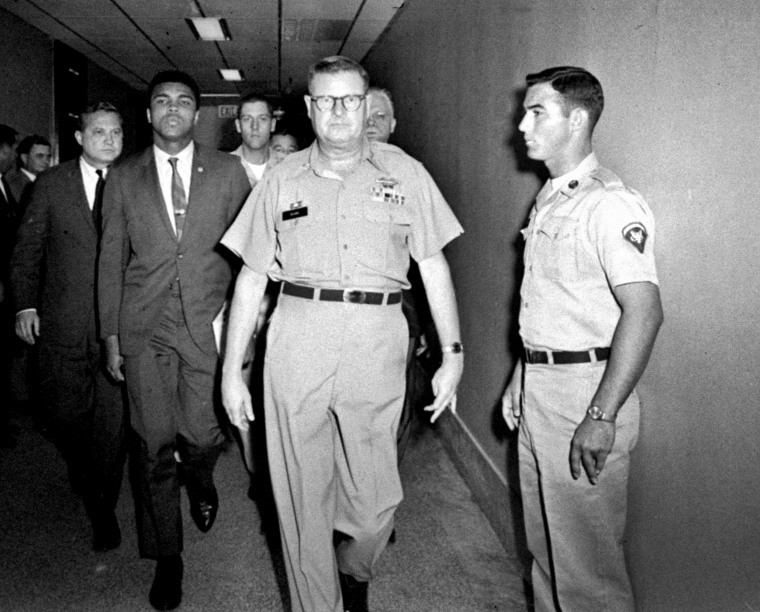 Ali is escorted from the Armed Forces Examining and Entrance Station in Houston by Lt. Col. J. Edwin McKee, commandant of the station, after he refused Army induction on April 28, 1967. Ali says he was a conscientious objector who would not serve in the Army of a country that treated members of his race as second-class citizens. Zora Folley moves in on Ali in first round of their heavyweight title fight in New York's Madison Square Garden on March 22, 1967. 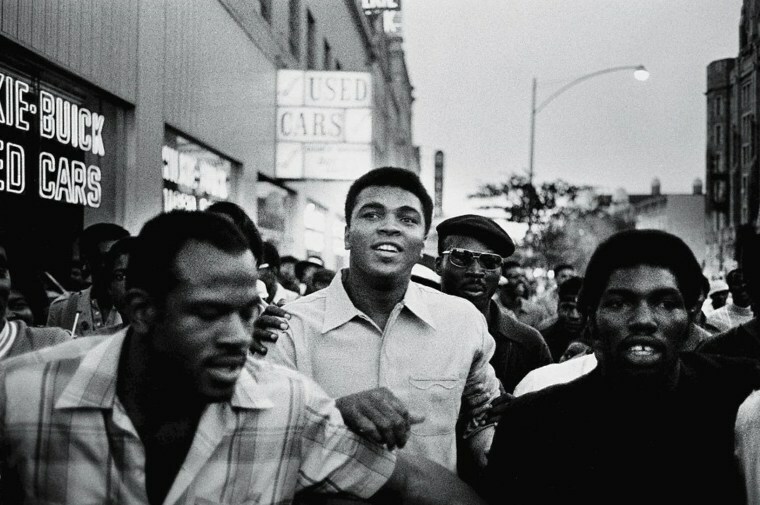 Ali walks with members of the Black Panthers through New York in September 1970. 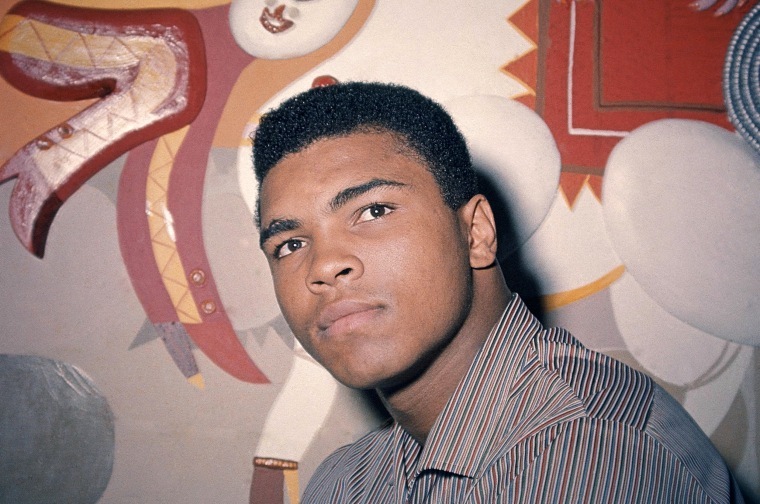 Ali was sentenced to five years in prison and his championship title was revoked after he was convicted of draft evasion for refusing to serve with the American army in Vietnam upon grounds of conscientious objection. The decision was overturned in 1971 but Ali became a figurehead of resistance and a hero of the people. 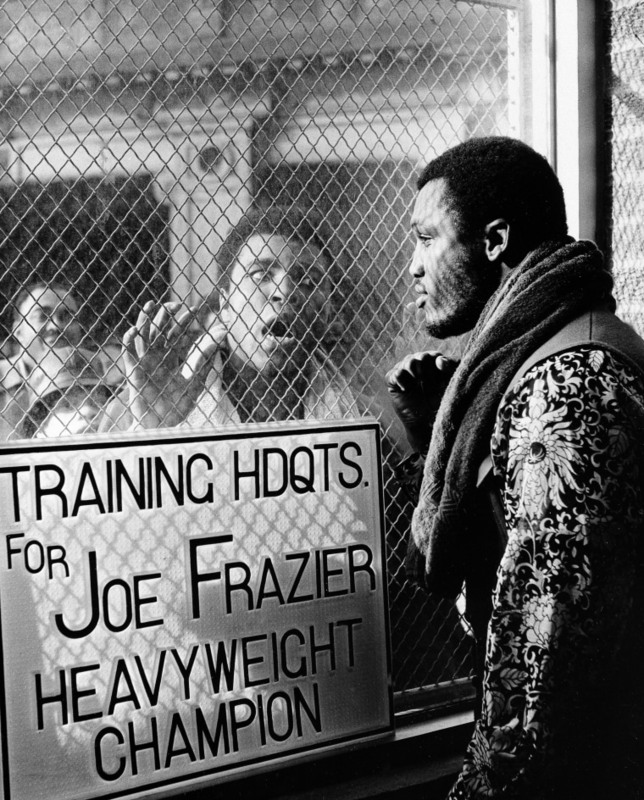 Ali outside Joe Frazier's gym in Philadelphia in January 1971. Joe Frazier is directed to the ropes by referee Arthur Marcante after knocking down Ali during the 15th round of the title bout in Madison Square Garden in New York on March 8, 1971. 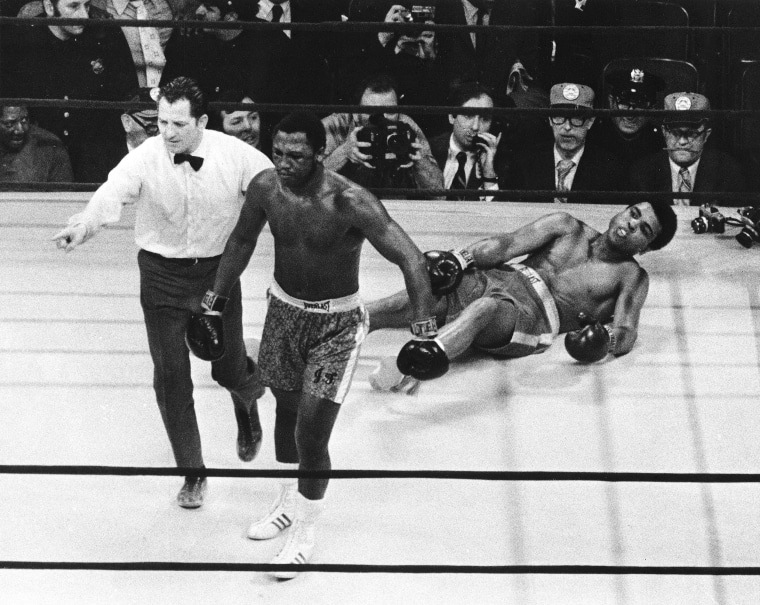 Frazier won the bout over Ali by decision. 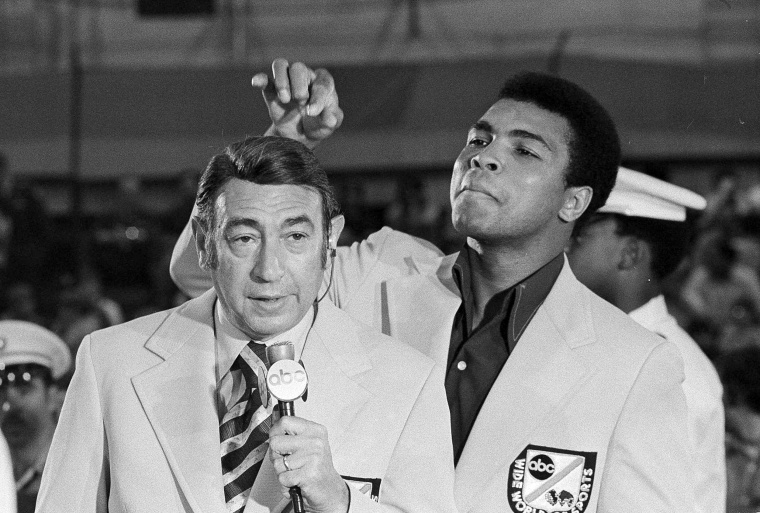 Ali toys with the hair of television sports commentator Howard Cosell before the start of the Olympic boxing trials on Aug. 7, 1972, in West Point, N.Y.
Ali throws a punch at Joe Frazier during their bout at Madison Square Garden in New York, Jan. 28, 1974. 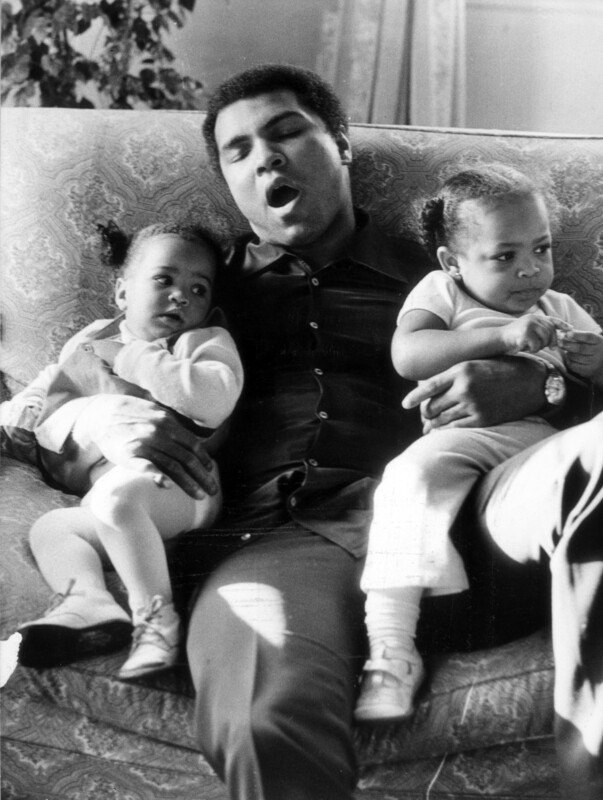 Ali yawns as he babysits two of his daughters, 9-month-old Laila and 2-year-old Hana, on Dec. 19, 1978. 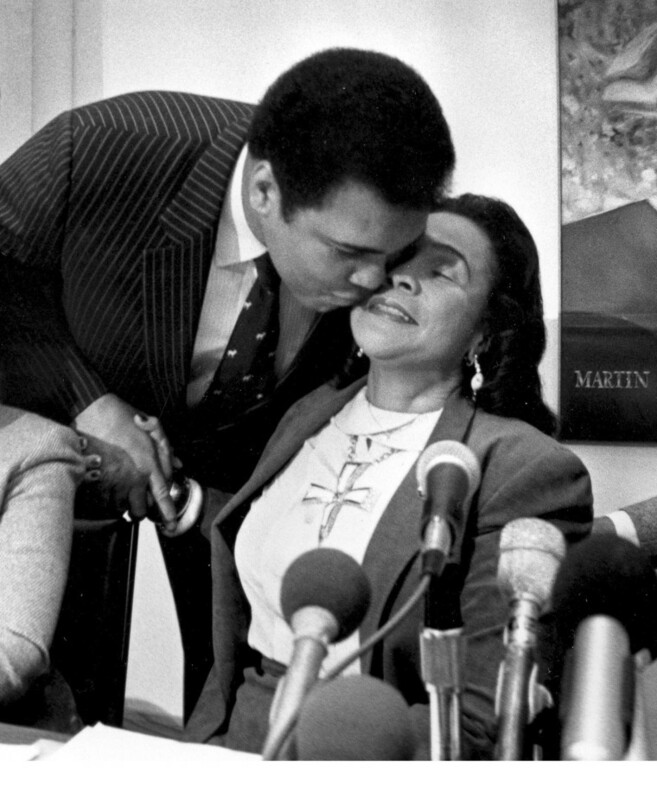 Ali embraces Coretta Scott King, the widow of the Rev. Martin Luther King, Jr., at a news conference in Atlanta, Ga., launching a celebration for the first national holiday honoring the slain civil rights leader, Jan. 10, 1986. 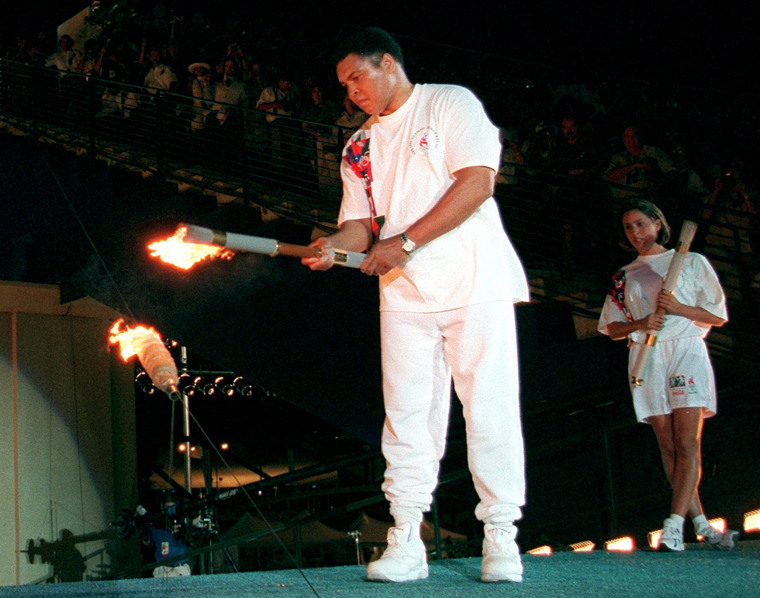 Ali lights the Olympic flame as American swimmer Janet Evans looks on during the 1996 Summer Olympic Games opening ceremony in Atlanta, July 19, 1996. 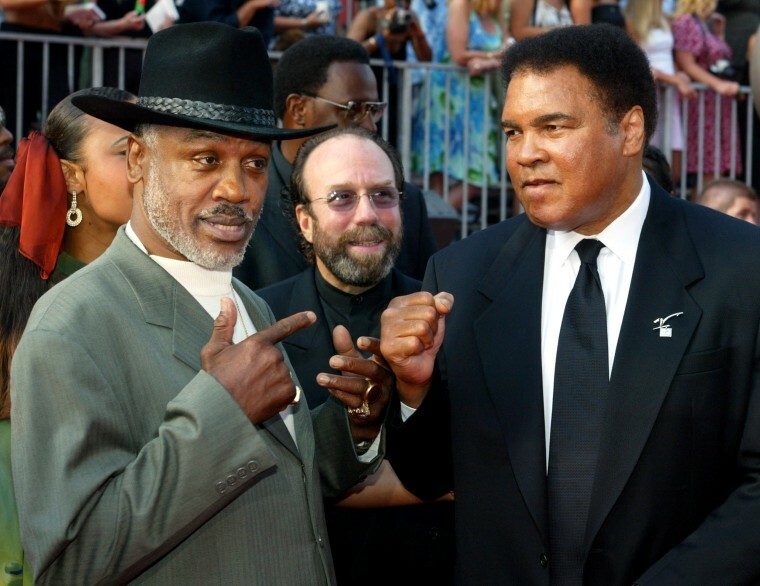 Boxers Joe Frazier and Muhammad Ali pose at the ESPY Awards, honoring excellence in sports in Hollywood on July 10, 2002. 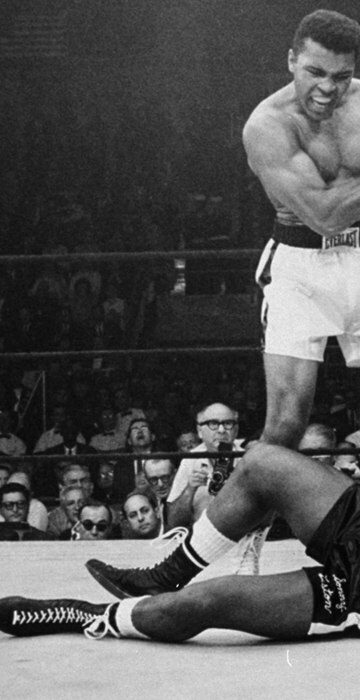 Former heavyweight champion Frazier earned boxing immortality after he fought three epic fights with Ali. Ali kisses his daughter, WIBA Super Middleweight Champion Laila Ali, following her third round TKO victory on June 11, 2005 in Washington. 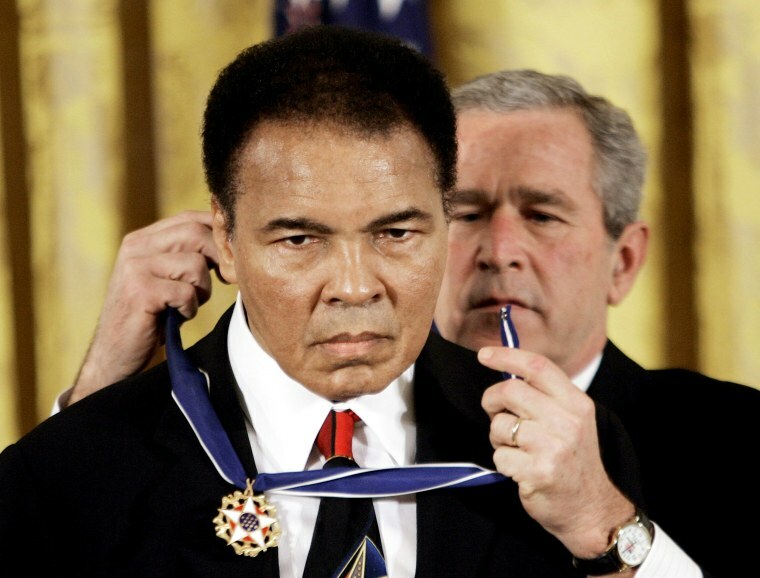 President Bush presents the Presidential Medal of Freedom to Ali in the East Room of the White House on Nov. 9, 2005. Muhammad Ali at an announcement of a new philanthropic initiative in Lexington, Kentucky, on May 19, 2009. Ali, his wife Lonnie Ali, and Pearse Lyons announced the Alltech-Muhammad Ali Center Global Education and Charitable Fund. Ali attends an NCAA college football game in Lexington, Kentucky on Sept. 19, 2009. 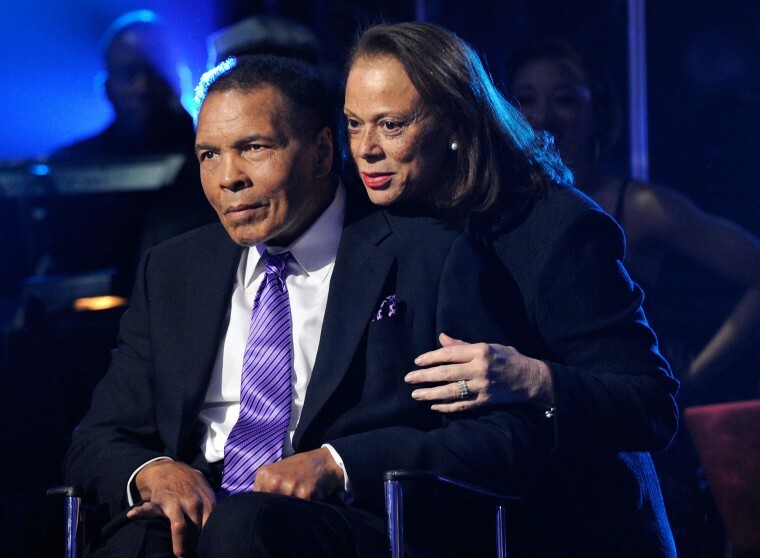 Ali and wife Lonnie during a celebration of Muhammad Ali's 70th birthday in Las Vegas on Feb. 18, 2012. 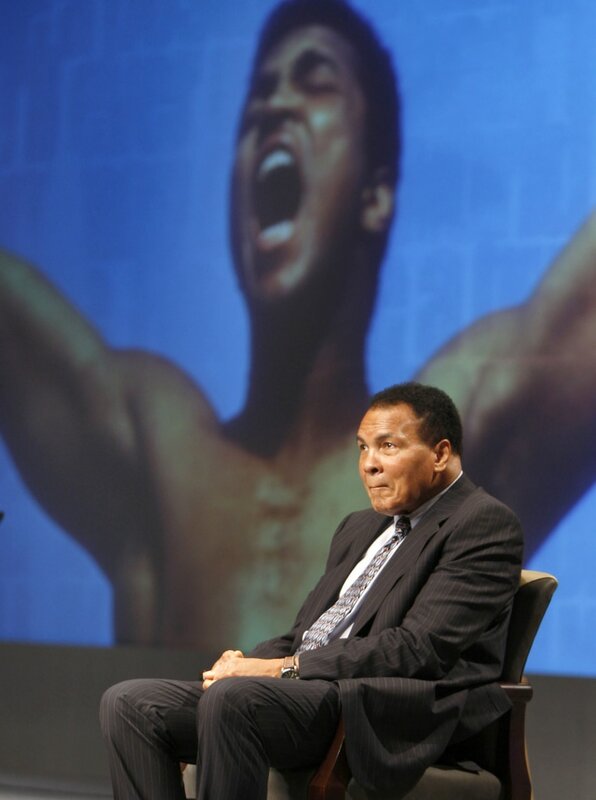 The event benefited the Cleveland Clinic Lou Ruvo Center for Brain Health and the Muhammad Ali Center. 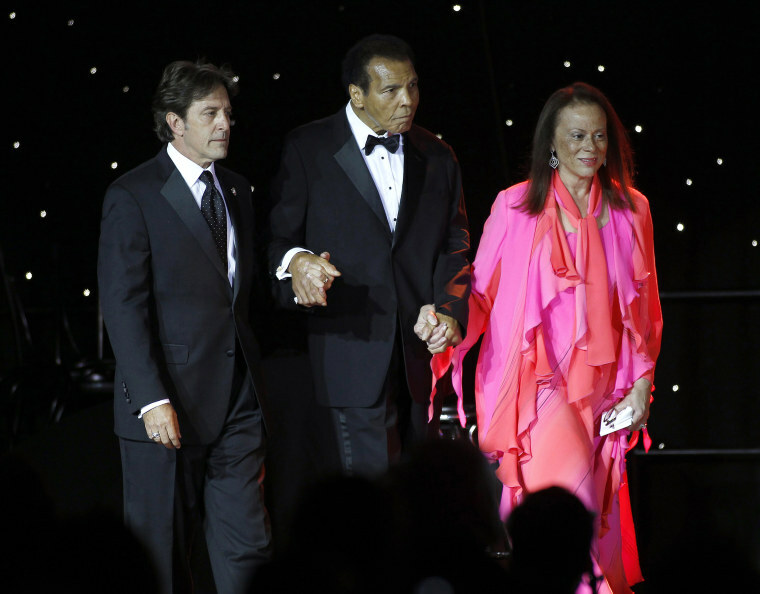 Ali is escorted on stage by his wife Lonnie and a personal assistant during The Muhammad Ali Celebrity Fight Night Awards XIX in Phoenix, Arizona, March 23, 2013. 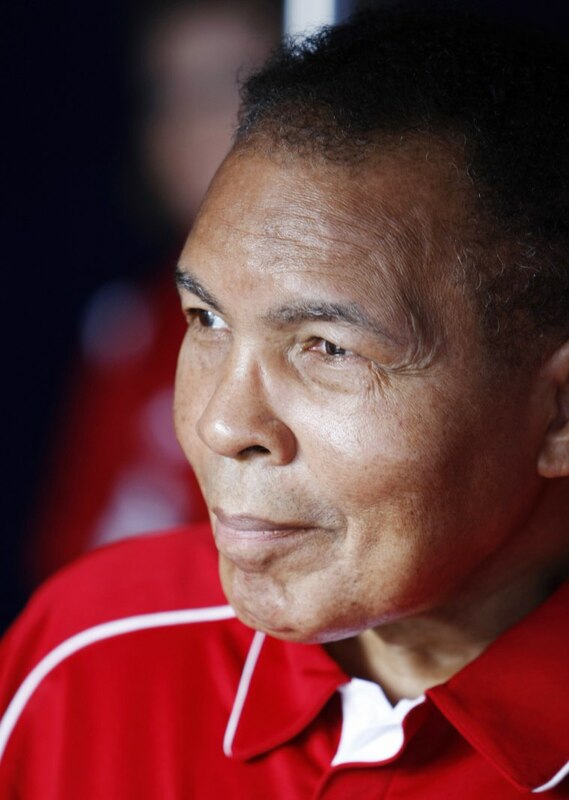 The awards are given out to celebrities who embody the qualities of Ali and his fight to find a cure for Parkinson's Disease. Ali attends Muhammad Ali's Celebrity Fight Night XXII at the JW Marriott Phoenix Desert Ridge Resort & Spa on April 8, 2016 in Phoenix, Arizona.